So with all the ice blocks, minecarts, lava, and cola ads in world 3, are they to be called the Colava Mines? Nice. I did my testing back in world 2 in a spot without access to deathpits, so the long time before an iceblock disappears stymied my efforts. Besides, doing a running jump off of an up-B-placed block to a midair down-B gets you far enough for everything I could find. I suspect the world 1 level showing vertical transitions could be skipped about thusly. as long as it's not so "useful" that the entire game ends up being played like that, and as it's still somewhat difficult to pull off. Also, iceblock power doesn't kill enemies, only stuns, which is a surprisingly large drawback! I've considered making it so that you have to copy an ability before you can buy it, but you can get the ice ability early on world 2, and you don't unlock the shop until you beat world 1 anyway. I'm actually not sure what good prices for items would be. I probably should go and make statistics for the amount of money in each level so I can get a feel for what the average amount is. 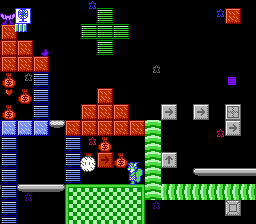 I really like those arrow block puzzles. I'll have to play this again now that I have an N8 everdrive. Really like the art style. You're probably gonna have to revamp the shop menu anyway, since it's close to full-up now (once you add more abilities). Probably break into sub-menus. An addition that currently might make sense: eat-in (that is, immediately applied) riceballs* pizza. Even if you do normally refill health between stages, an eat-in XL would make sense [starting with 8 rather than 4]. Of course, a small discount would apply compared to take-out. Bug report: You can reorganize the pause menu on page 2 with select, but it doesn't move the actual actions (at least, not Exit Level- I moved it to the bottom, and it did nothing there, but empty slot 1 then would still exit level). It also doesn't save the new positions…unsurprising as I don't think this was quite intended. hey, the shop menu doesn't wrap horizontally. That would reduce the maximum number of presses to get to any item by 3, y'know. A buy-multiple (10?) option would be nice? The shop doesn't tell you "you can't have more of those" when you try to buy more than 99 of an item, though at least it doesn't charge you. Huh, world1's music is gone. Ten abilities seems like a good number to me. Kirby's Adventure (for comparison) has about 20 normal ones, with weird duplicates like fire/burning and ice/freeze that I would have combined. You're right that there isn't a lot of space for potential additional items of any sort in the future though. The eat-in could make sense for fixed-inventory stages, giving you a little help since you can't carry outside items in. I took out the music a long time ago because a <30 second loop that plays throughout the entire game got a little annoying. I'll probably actually use that theme a bit later in the game. Nice game. The controls feel a bit too slippery for me, though, even with the slow setting. Yeah, I'm not sure if I actually want to fix that or not? Since it provides some leniency that might be helpful, but I also get complaints about it. I'm not sure what I should do about the slipperiness, probably provide a mode that turns off acceleration completely? But I think instantly jumping between speeds of 0, 2 and 4 pixels per frame might not be very good for a game that requires a lot of accuracy. There's the "fast" acceleration mode at the very least, which doubles acceleration and deceleration speeds. if you slow down just before falling off a block and turn back while falling, you "zip" back up. I created an animated GIF. This is the sort of helpful collision bug that often pops up in Nova's games and eventually gets turned into a similar official behavior. Something similar happened when I remade Nova's Forehead Block Guy in Pygame. The original had a bug allowing sticking to a wall and jumping from it, and I recast it as the ability to grab a ledge and scoot up like in Prince of Persia or Super Smash Bros. My version added a tradeoff between mobility and offense: ledge grabbing can't be used while tossing blocks. My goodness, it's been a long while since I updated anything on here, hasn't it? Nova the Squirrel is still being developed. I think I have about 7 levels and 4 bosses to make before I think I'm satisfied with the gameplay aspect of things (for a total of 33 regular levels and 7 boss ones), which I expect to be able to finish this year? Though I continually said that the other years too. Really the hardest part throughout the whole game's development has just been level design which pretty much requires me to solve a puzzle in reverse. The remaining levels are mostly action-oriented so that should help a lot. Aspects that don't require a lot of creativity should also be quick. 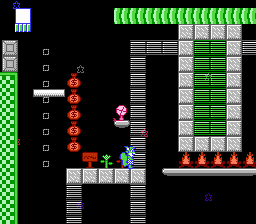 I am most likely going to push past 128KB into needing a 256KB cart, but not by much and that'll give me space to play around with just freely adding stuff without caring about size. 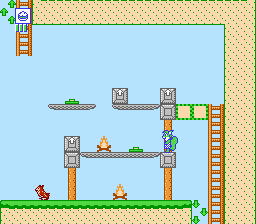 I have ideas for stuff I'd put in that wouldn't take long, like a level editor, a copy of DABG, concept art, maybe two music banks, etc. After the gameplay I'm going to want to add a lot more polish and I need to put in a soundtrack and everything. Some of the polish I've been focusing on has been making the game just look better (especially on the first world) so I can convince people to keep playing and get to world 2, where the real fun starts. 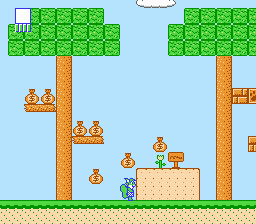 I'm adding more tilesets to make the game more visually appealing and I'm trying to add a lot of graphics if I can. These giant trees reuse already existing metatiles which works nicely because I'm not running up against the engine's 256 metatile limit. Though, I have ~50 left anyway, and the game's getting close to done so it won't matter. 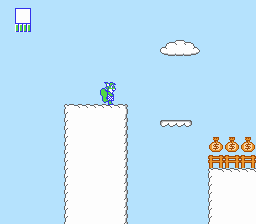 A cloud theme for levels that are set up high in the sky. Animated water. I guess I need to learn how to draw animated water now, preferably with more than two frames of animation. Maybe other things would make sense to animate? There's fake parallax using sprites in some levels too now. I've also been adding a lot more mechanics like laser beams that are blocked by obstacles and that act as walls, blocks that can spawn in enemies, and other stuff. There's now a one-per-level collectible that is usually behind some sort of challenge. Really impressive stuff! How close are you to finished? I'm getting close. I'm aiming for a summer release of at least the ROM. For hardware release, why SNROM instead of the A53 mapper? Anything that's a superset of UNROM with WRAM will work. I guess I say SNROM since it's the most common board with that criteria.